Now that we've hit five weeks until baby, in addition to the name thing (which we're working on thanks to you all! ), I'm also getting lots of nudges about nesting. It's true -- as organized as I am about so many things in life, we have done nothing in the nesting department. I figure there's plenty of time to sort it out, and perhaps I'll feel inspired following the baby shower my friend Heidi is throwing me this weekend. When Heidi offered to host the event, I asked for a secondhand/recycled shower since: a) I'm an eco-geek; and b) so many of my mom friends are done making babies and are eager to pass things along. However, I'm also planning to stop at Old Navy -- both to pick up any last minute needs for the baby, and also some spring things for Laurel. Read on to see some of my favorite picks, as well as to learn how to win a $100 gift certificate to Old Navy! Bodysuits were a staple for us with Laurel; they're the perfect layer under a hoodie. And I adore the cuteness of this contrast sleeve animal bodysuit and this polka dot kimono bodysuit. 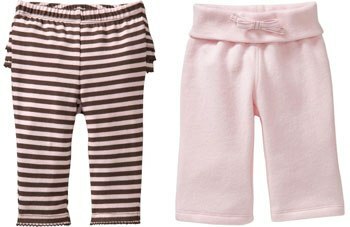 I'm a big fan of soft pants for babies (and grownups too!). Denim for newborns admittedly never made sense to me from a snuggly factor, especially since I wore Laurel in a sling so much and plan on doing the same for her sister. I love these little ruffled leggings, and the yoga pants will be good too, since I'm planning on doing mom/baby yoga this go around. 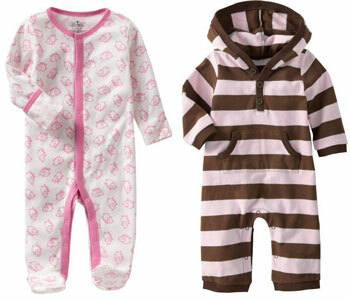 I love one pieces for babies -- they're draft-free and so easy (except, of course, when you're dealing with a blowout). This piggy one-piece is great because it's footed (no need to worry about socks!) and has foldover cuffs to prevent scratching. I also love the boldness of this striped hooded one piece. I think the pattern on this hooded tee is totally rad. And this embellished tee is something I would totally wear. And Laurel loves my clothes so I bet she'll love it too. These color-blocked yoga pants have me wondering whether I could negotiate Laurel and her baby sister in a yoga practice. 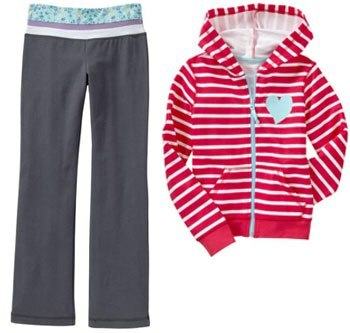 And in my opinion, you can never have enough cute and snuggly hoodies for kids. We're big on layering in our house. Laurel loves dresses. 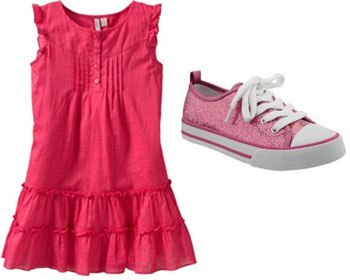 This ruffle dress gives me hope that spring is around the corner. And while Laurel typically prefers Velcro or buckle shoes (faster on and off), I suspect these glitter sneakers would inspire her to tie laces. Hop on over and check out the Old Navy baby and kids sale and leave a comment below, telling me one of your favorite picks from the sale. US & Canada entrants welcome. One comment per person (please do not leave comments from multiple e-mail addresses). Anonymous or SPAM-like comments will be removed. Note that your e-mail address will not be published or shared! Leaving just your first name or first name + initial in the name field is perfectly fine. Entry period closes at midnight EST, Sunday, February 13, 2011. 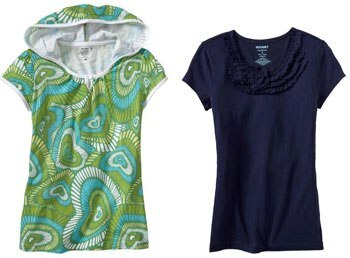 One lucky winner (drawn randomly via Random.org) will receive a $100 gift certificate to Old Navy.